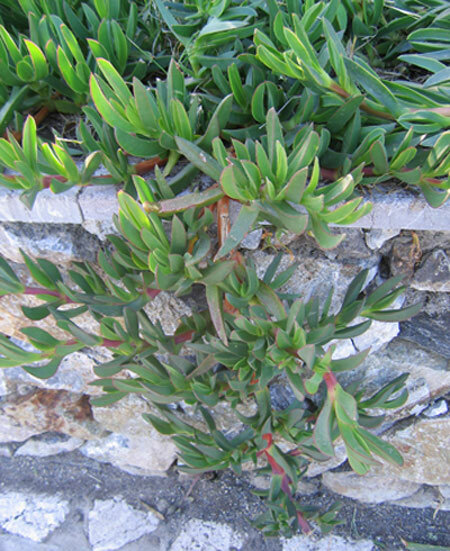 This is a succulent annual or perennial from S. Africa which we saw growing in pure sand by many of the beaches we visited on the Greek islands of Corfu, Naxos, Paros and Antiparos late in the spring of 2007. The flowers come in brilliant colors and this is one tough plant to grow so happily on almost nothing in a climate where high temperatures can be well over 100° F., where rainfall is not so common and where winter brings freezing temperatures. I liked it so much I saved some seeds from the ice plants and some from other wild flowers in Greece and was hoping to have a "Greek Garden" at our former home in Montserrat. Now I'll have one in our new garden in Guatemala. Planting and Growth: This is a peculiar plant liking full sun, any type of soil and almost no water. Photographed: On the roadside in Sicily, Italy, in 2012. Photographed: At the Hacienda San Buenaventura on Lake Atitlan in Guatemala. **Impatiens, Jewelweed, Touch-Me-Not, Snapweed, Patience, Busy Lizzie Impatiens sp. 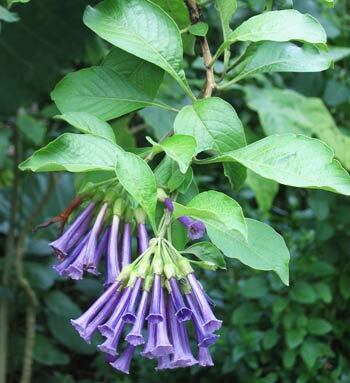 This is perhaps the best known and most commercial of shade garden flowering plants. 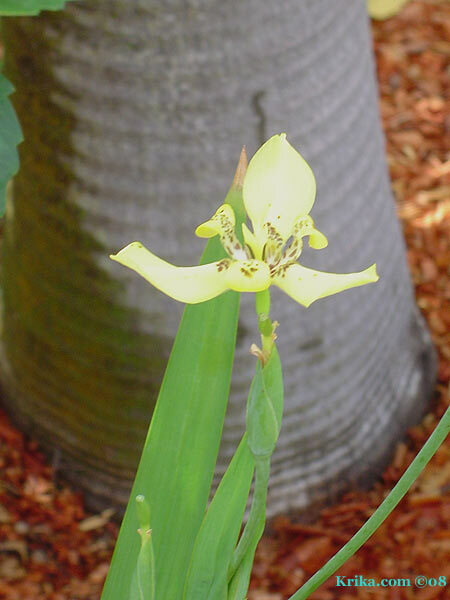 In tropical climates they are perennials, but not in places where winters bring freezing weather. A lot of hybrid work is being done to dress up the common look of this shade garden standby as you can see in the photographs below. I think the changes are lovely. 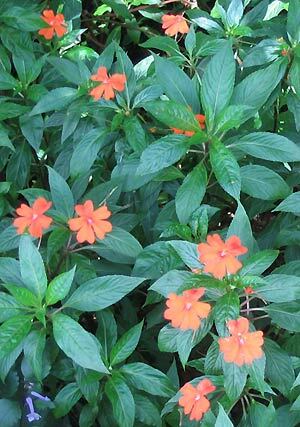 Benefits: Impatiens plants have a wide variety of medical benefits. It has anti-inflammatory and fungicide uses along with being used as an herbal treatment for bee stings, insect bites, and stinging nettle rashes. 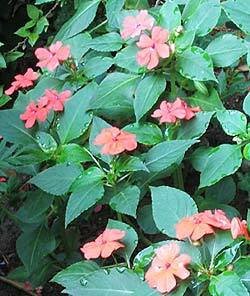 Unfortunately impatiens also carry some toxic substance(s) that may cause vomiting and diarrhea. Speak to your physician before using this or any other plant as a health remedy. From: Primarily Asian and African tropics, but there are so many plants in this family you may find one or more from other places. Planting and Care: This is the proverbial shade garden blooming plant and it is as easy to care for as it is unremarkable. Plant it in good moist soil in the shade and give it routine watering and you will have a bit of color where there was only green before. 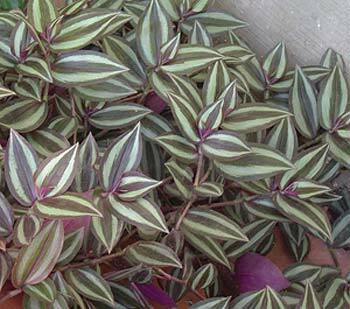 With its leaves and spreading nature, the inch plant might be a good option for a ground cover. Once you plant it though, plan to live with it forever. It is very difficult to get rid of. 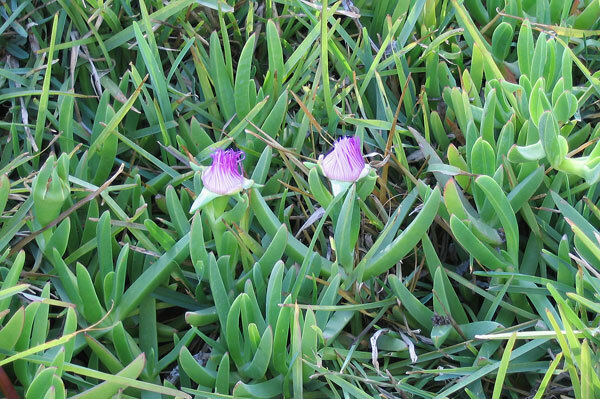 Benefits: Other than its ease of growth as a ground cover it is used in some places in Mexico as an herbal tea. 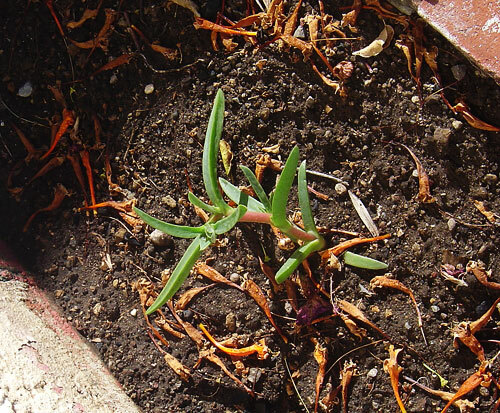 Planting and Care: This plant is a true survivor. It will grow in full sun or full shade and will tolerate a wide range of moisture levels. In many places it is considered invasive so be sure you want it before you plant it. In Montserrat we had one of these bushes locally called a gardenia, but it had no appreciable scent and so can't possibly be even in the gardenia family. 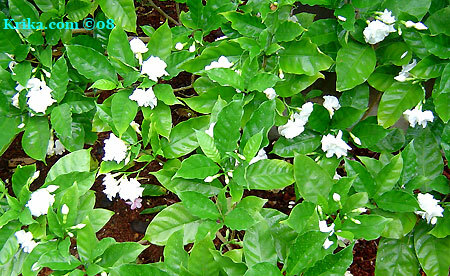 It has shiny deep green leaves and abundant creamy white flowers. 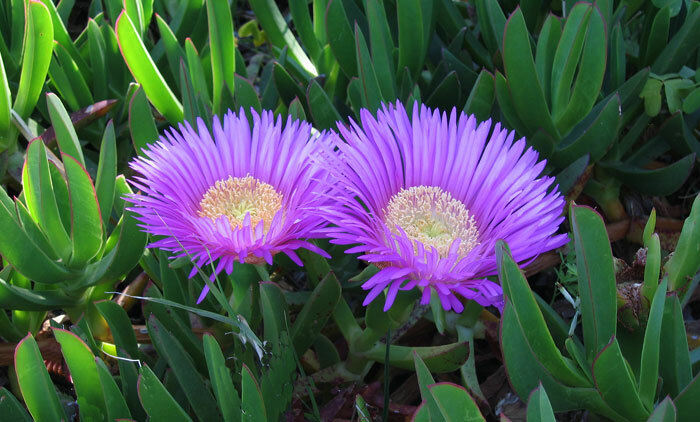 Benefits: It is said to have medicinal uses, but it is also said to be poisonous. 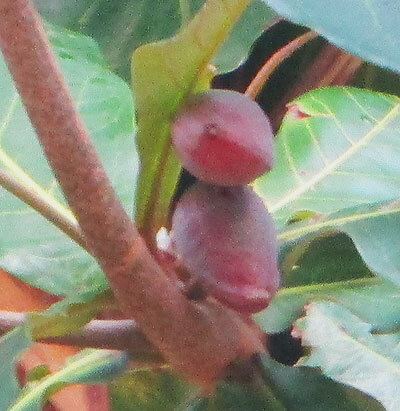 Photographed: In our terrace garden at our former home in Montserrat. Planting and Care: The crape jasmine is a hardy bush that grows at an alarming rate, all while providing lovely white blossoms. Sadly, they don't have much of a scent. Ours survived in a semi shady area with little care; we have seen them also growing as well with no care. These are wonderful plants to consider for a tropical garden, but the flowers lack the size and scent that truly defines the gardenia of my dreams. 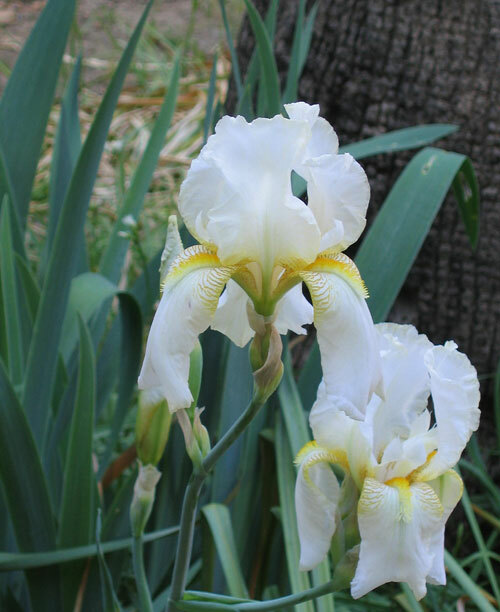 This variety prefers bright light shade, moist soil, and a lot of fertilizer. It will produce a prolific number of blossoms. Text and Photograph ©Krika.com 2008/2010 and GreenGardeningCookingCuring.com 2013/2018. Left untrimmed this tree will reach a mature height of over 100 feet. 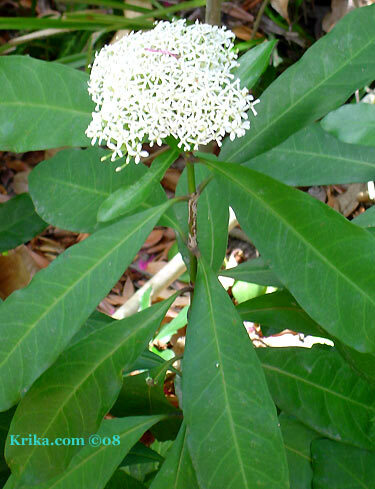 It has large leaves and provides deep shade beneath its very large branching limbs. When the weather becomes very hot and dry it loses its leaves, but not before turning them a deep red. 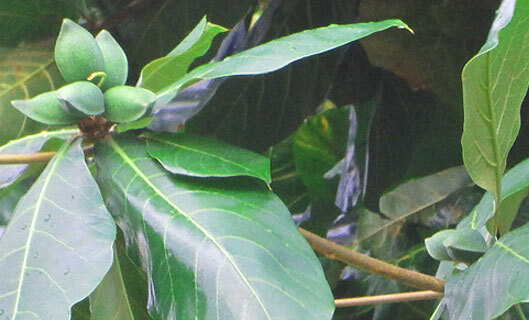 Benefits: In Tobago in years past, almonds from this tree were coveted as they are delicious. Now, with the use of pesticides and other toxic garden chemicals the almonds are left to their own devices. The wood of these trees has been used in the building of canoes and there are many and varied traditional uses for its leaves. From: Its native environment isn't certain as it is a tropical tree that spread more or less around the globe in tropical environments. Photographed: At the Crown Point Hotel in Crown Point, Tobago, in 2018. Planting and Care: As always, when someone wishes to plant a tree I advise them to seek advice from the seller of their little tree or from their local college or university agricultural department. That being said, this wonderful tree likes to live in full sun and to be planted in sandy loam with a pH of between 5.5 and 6.5. It will also appreciate year round routine rainfall or watering until it is fully adapted to your garden environment at which point it can handle some degree of drought. 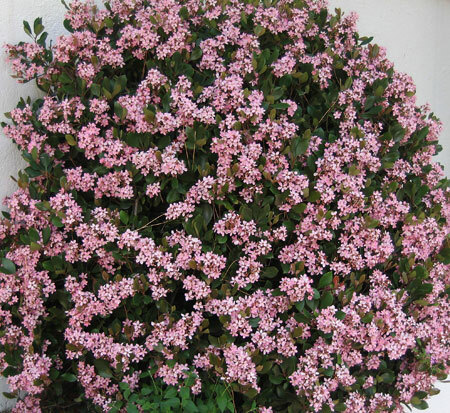 This is a warm weather plant that grows well as a border for the house foundation, as a hedge and even as a small tree. Benefits: The flowers of these lovely plants produce edible berries which are often used to make jam. Photographed: In a private garden in Sicily, Italy, in 2012. Planting and Care: Grow in full sun in relatively moist soil to have a fall and winter blooming joy in what can be a pretty dull garden in those times of the year. 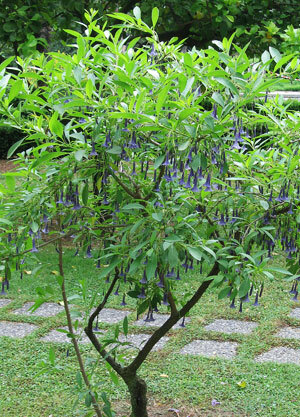 My #28 Shrub Mystery was solved by Glenn a visitor to my website who lives in Brisbane, Australia. Many thanks for your help. An infusion is made when you pour boiling water over plant parts and drink it as a tea. When it is suggested that you make an infusion, do just that. Do not boil the plant materials as they may prove more damaging than helpful. A continuing struggle between me and my husband over "cures" might be summed up well for everyone, "Some is good, more is not better." Those listed are the only ones we use and all are natural products. 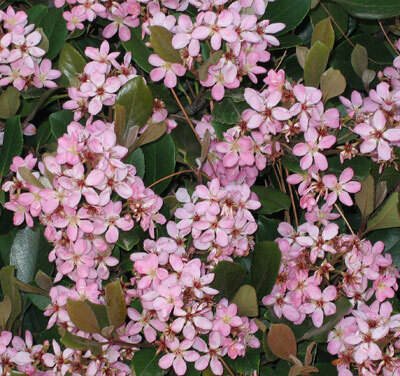 This is an unusual flowering shrub that will bloom for months and months. 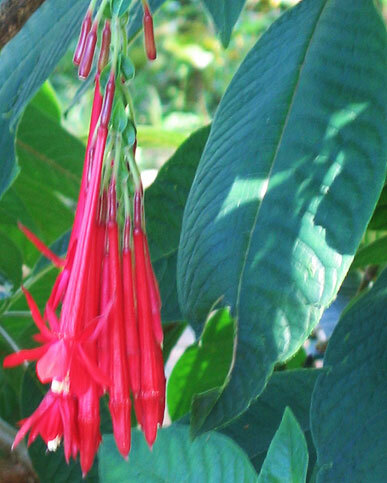 Benefits: This lovely plant will not only look good to us, it looks good to butterflies and hummingbirds too. Note: Contact with the sap of this plant can be irritating so it is probably wise to use gloves when working with it. All parts of the plant are very toxic if ingested. 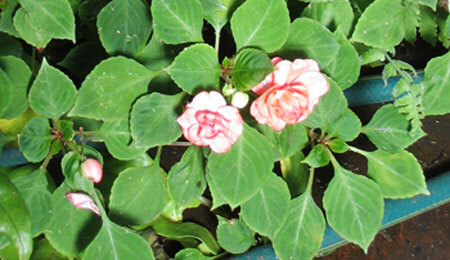 Planting and Care: This plant likes to be in either full sun or semi shade. This is a huge family of plants. 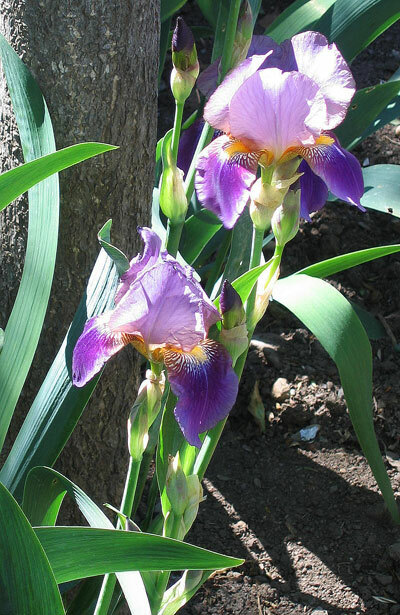 They are perennials growing from creeping rhizomes, but in dry places they grow from bulbs. They commonly found in gardens in temperate climates around the world. 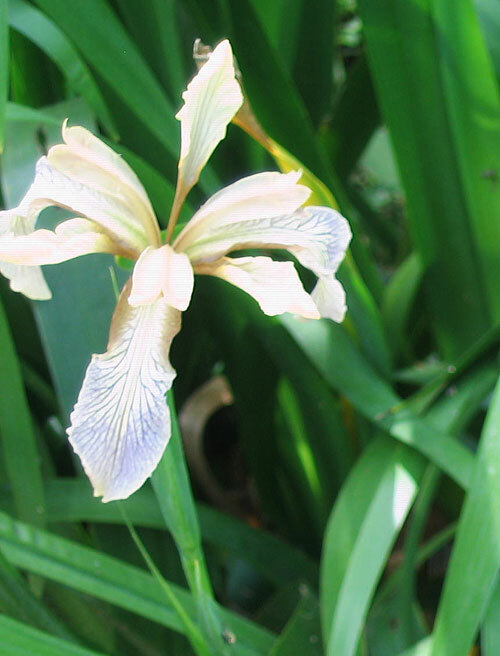 For the most part, irises are not fussy about their environment, though there are species that grow best in or on the edge of a body of fresh water. This is a flowering plant I loved at first sight when I was a very young child. I loved them then and I still do. Benefits: Beautiful flowers on very easy to grow plants. 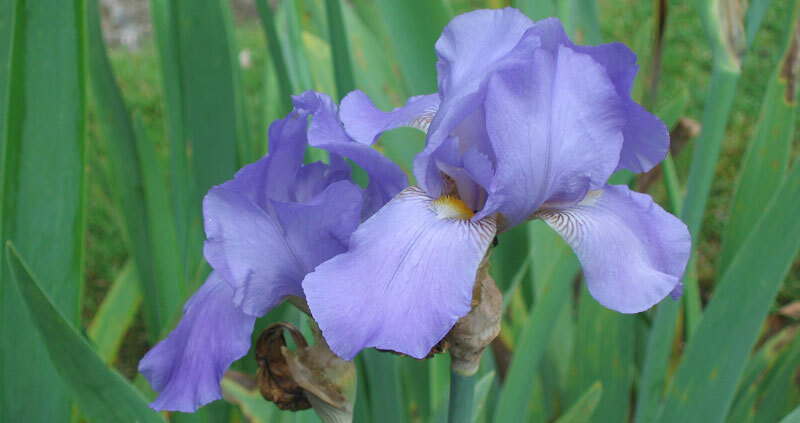 Planting and Care: For all of its elegant beauty, the bearded iris is hardy. They even grow and flower beside multi-lane highways in Mexico City. Give them full sun in more northerly places and some afternoon shade in hotter climates and they'll be just fine. Water when dry and always plant them in places where there is good drainage. They do prefer a slightly acidic soil which should be easy to provide. With some of these beauties in your garden, you will never be disappointed especially with the lovely delicate scent of their lush flowers. 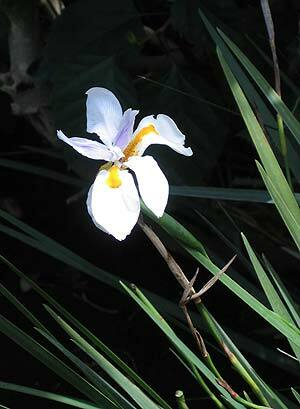 Photographed: We found this one growing in the Palermo, Italy, Botanical Garden. Photographed: This appeared to be something of an after thought in the Naples, Italy, Botanical Garden. 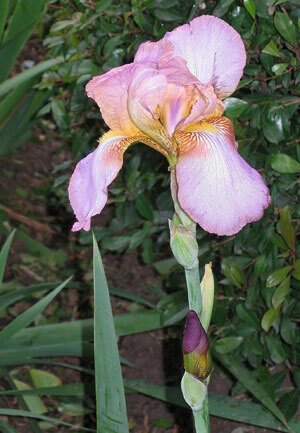 Photographed: We found this one growing in the city street gardens in Malaga, Spain. 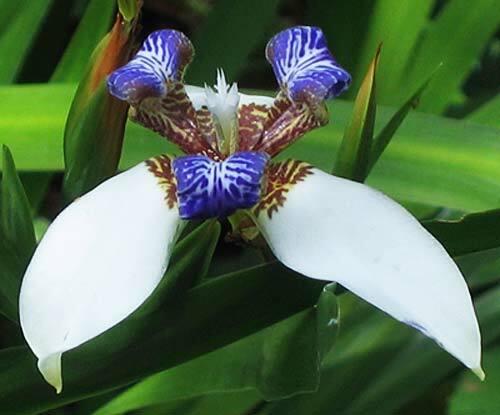 Photographed: In the Buenos Aires, Argentina, Botanical Garden. Photographed: In the Naples, Italy, Botanical Garden in 2014. 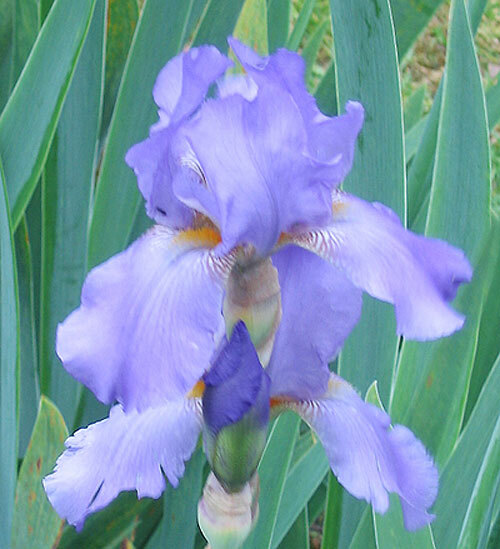 I don't think this is a real knock out iris, but it probably would be a good choice for an iris collector. Its unappealing name comes from the fact that its leaves have a meaty smell when brushed. Left alone it isn't an issue. 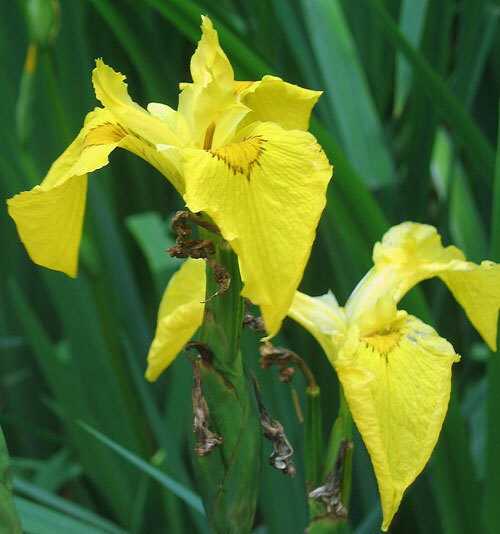 Planting and Care: As you can imagine from its native country of Britain, this is a temperate climate iris which will do just fine through those terrible winters. Plant it where it will receive full sun and regular rainfall or watering. 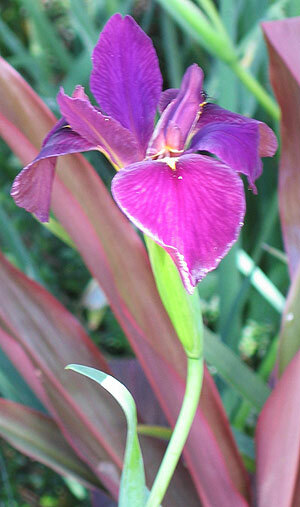 These are not large iris flowers, but they do stand out for their combination of colors and patterns. 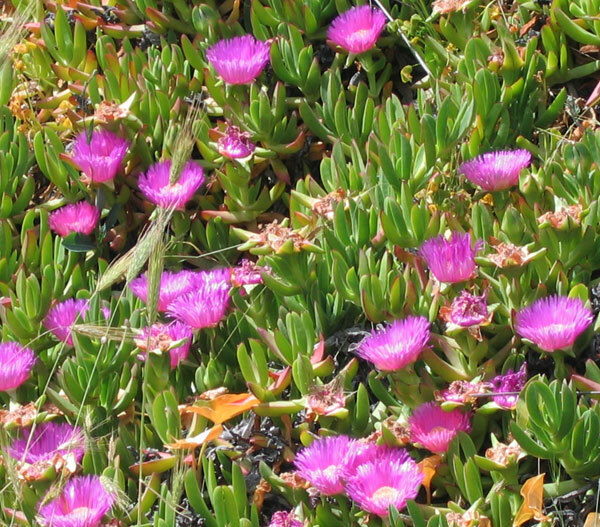 The foliage of these plants is no larger than about 2 feet tall. I had these lovelies growing along the the entrance walkway to our home in Guatemala and have learned a little more about them. 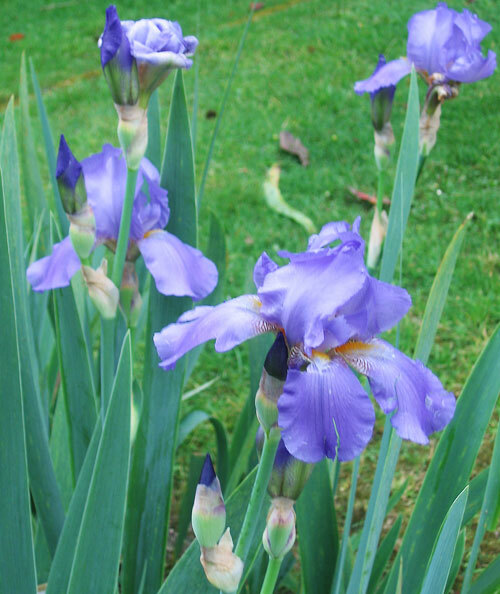 First, they are much like walking iris. 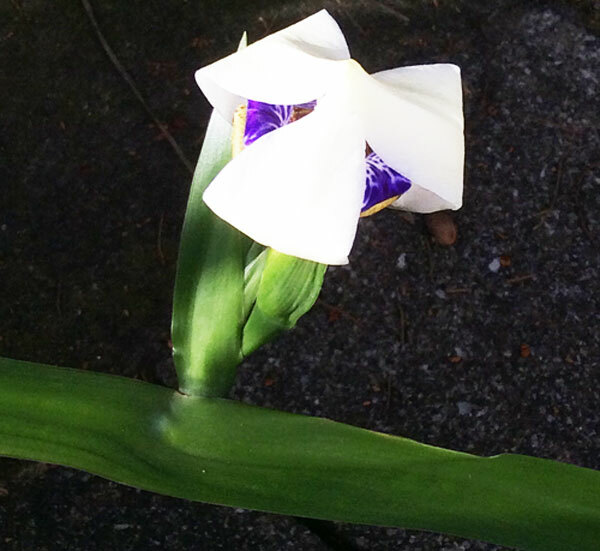 They bloom for a day at which point the stem leans over and attempts to plant itself. So far, they appear to bloom twice a year, heavily in the cool dry winter months and lightly in the mid summer rainy season. Planting and Care: Plant in full sun as I have seen them growing or in bright light and they'll do just fine with routine rainfall or regular watering. 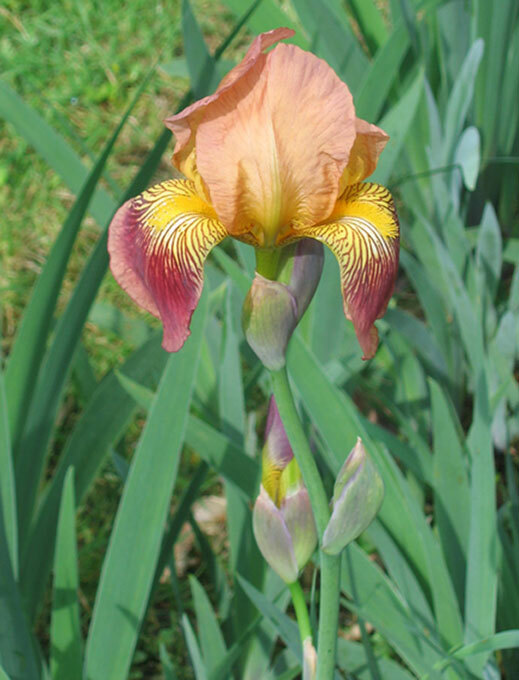 While I love almost every iris I've met, this one is especially appealing. 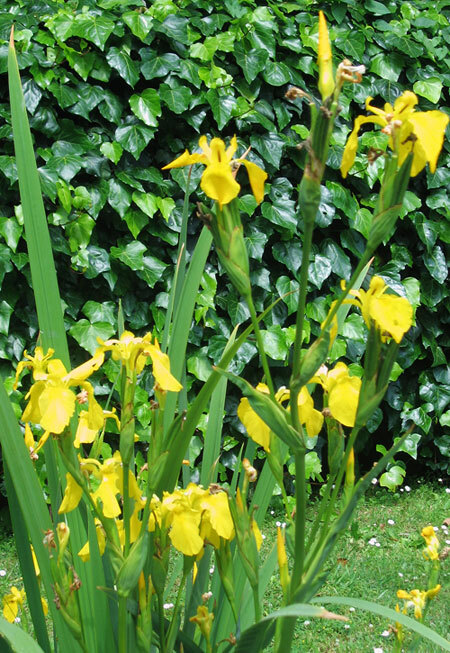 It is tall, 3 feet or more, and its bountiful yellow flowers are delightful. Benefits: This is an especially valuable plant in that it has the capacity to take in heavy metals through its roots. 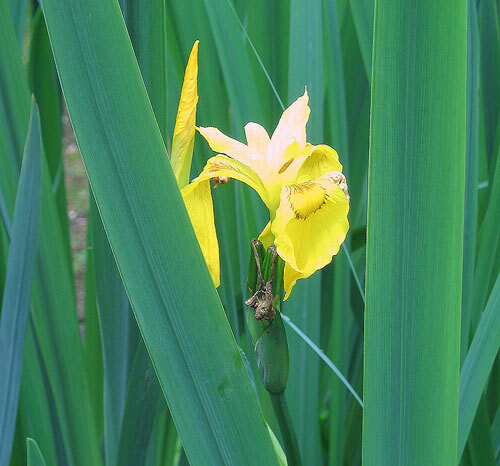 Planting and Care: This is one of those many irises that prefer an aquatic environment. Photographed: In the Orto Botanico in Naples, Italy, in 2013. Photographed: In the Orto Botanico in Naples, Italy, in 2014. This is a delightful variety of iris that starts off flowering in a very minimal way and then works itself up into producing a lovely show. It proved to be very hardy, handling droughts and acid rains along with falling ash from the Soufriere volcano in Montserrat. 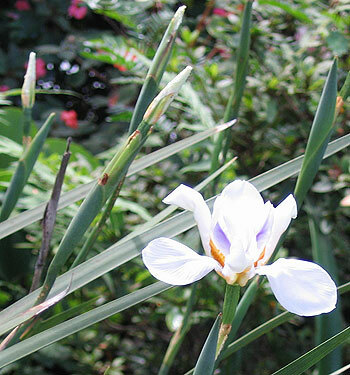 Photographed: This photograph was taken in the garden by our driveway at our former home in Montserrat. 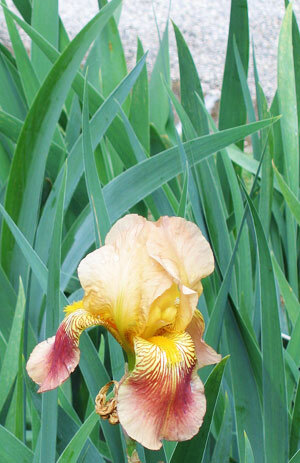 Planting and Care: The walking iris is able to grow well in full sun or shade and pretty much with or without water. 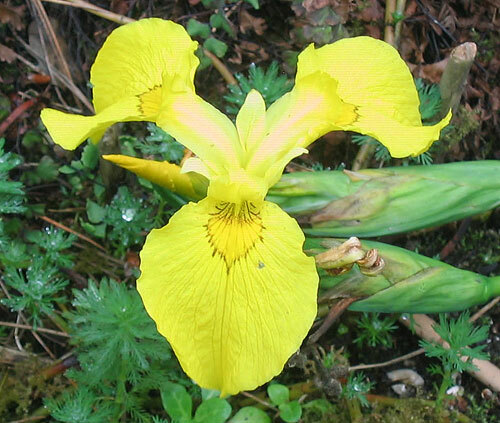 It produces flowers on an ever extending branch that eventually falls over and takes root; hence the name walking iris. This is another of the very old standbys in English and New England gardens. 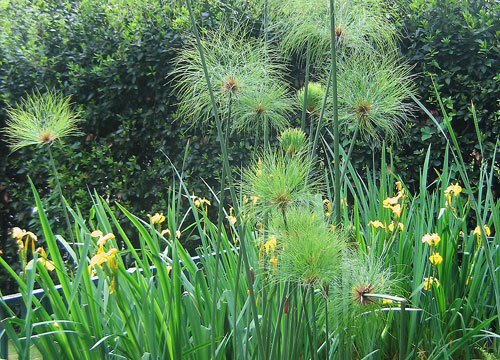 It is perfect for growing under trees where grass has difficulty thriving. I have not often seen it in more tropical climates and that's a shame because ivy has some unexpected very positive qualities. Benefits: As it turns out this standby plant is good for the environment and especially good for you. 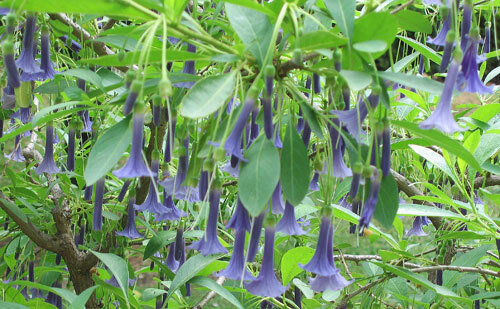 "Available in all kinds of colors and shapes, this climbing vine helps clear out formaldehyde. It’s super versatile, too: You can grow it in hanging baskets, low planters, or even as a topiary." Thank you Yahoo news. A member of the coffee family, this flowering bush blooms almost all year, though summer and fall are best. After a while, we had only red and yellow varieties and I like the yellow ones best. I had the pink ones removed as they never seemed to thrive. 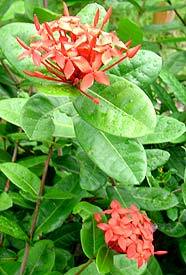 Benefits: Ixora is said to have medicinal uses from the flowers and from the bark, though I don't know what they are. In Asia the roots are used to treat diarrhea and stomach problems. Photographed: In our garden at our former home in Montserrat. The white ixora we photographed at a friend's home in Woodland's, Montserrat. 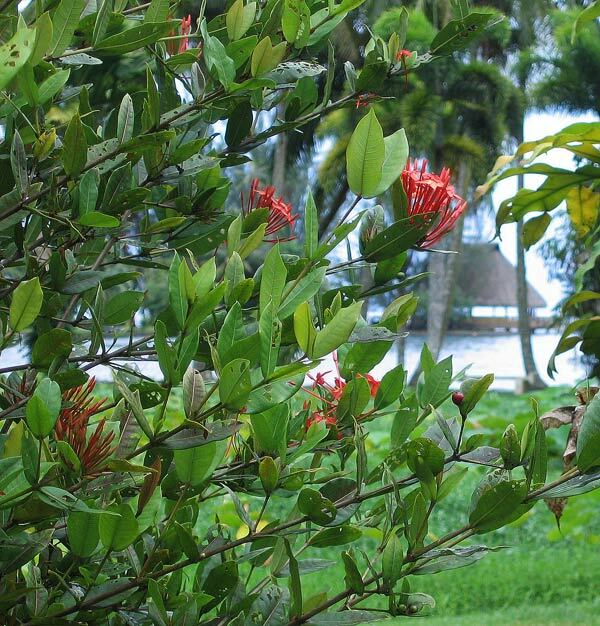 The large photograph of red ixora was taken in the Jardin Botanique in Tahiti in 2013 and the large pink ixora was taken in Crown Point, Tobago, in 2017. 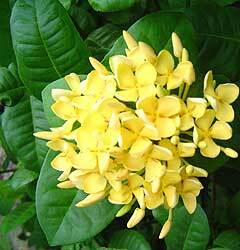 Ixora are not my favorite plants. Until I saw the white flowering ixora in the photograph to the left I felt that only the yellow had any merit and even then not much. 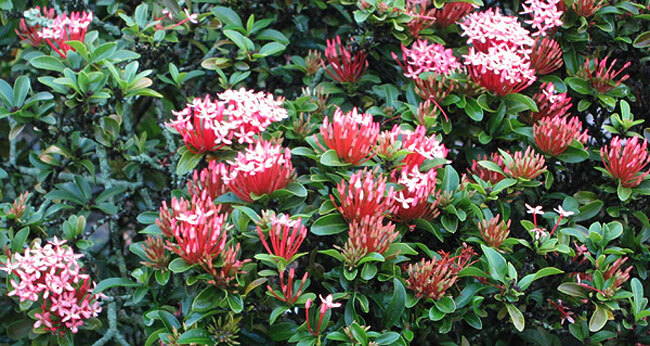 I had removed all of the pink ixora from our garden and many of the red as well. 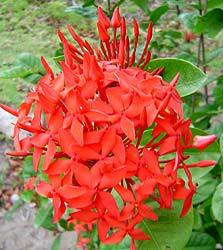 We still have a few red flowering ixora and one huge yellow flowering plant. In our nursery garden we now have a few cuttings of the white ixora which seems the best of all. 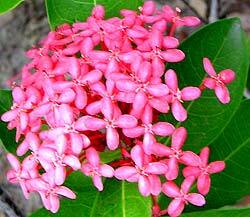 The white flowering ixora is wonderfully scented and its delicate flowers seem more at one with its leaves. Photographed: At a friend's home in Montserrat. 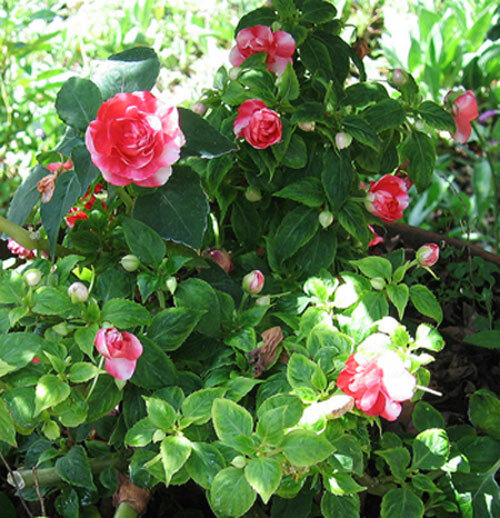 Planting and Care: Plant this shrub in full sun and give it a good regular watering to keep it happy. Its blooms are not real standouts, but they do smell heavenly. At its best it will be about 5 feet tall.